I've taken the threading to the tumbler. Working to simplify the composition, I'm threading a single bead of colored glass over the whole vessel. 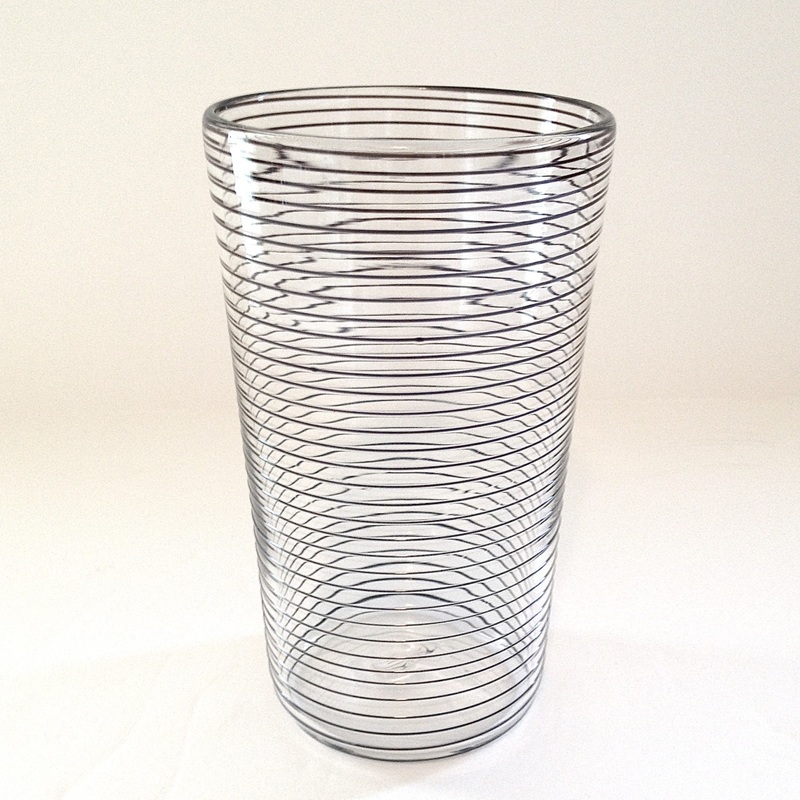 This Allows for a sophisticated yet simple decoration which adds to the function of the Tumbler itself. The spiral thread of glass is melted in more towards the lip (making the base of the cup easier to hold with a slight knurling). These cups are identical in size to the original large marbled tumblers I've been making for years, so they will hold at least 16 fluid oz. Dishwasher safe. A solid and trustworthy drinking glass. We make our cup out of clear soda lime glass. Moments before the punty transfer, we thread a single bead of Silver Blue Glass onto the outside of the Tumbler. The threading is melted in more towards the lip (no texture to interfere with drinking). Towards the base, the higher relief decoration adds to the function. One can hold onto it better! A "no-slip" grip, indeed. 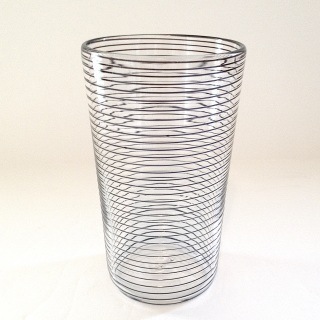 Measuring 3 3/4" w x 5 3/4" h. Dishwasher safe. Will bring a lifetime of libation. A solid and trustworthy drinking glass. 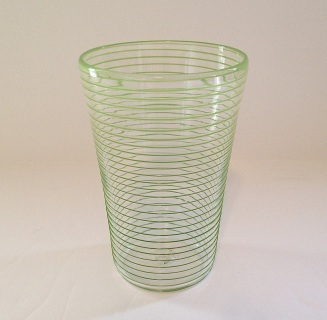 We make our cup out of clear soda lime glass. Moments before the punty transfer, we thread a single bead of Opaque Orange Glass onto the outside of the Tumbler. The threading is melted in more towards the lip (no texture to interfere with drinking). Towards the base, the higher relief decoration adds to the function. One can hold onto it better! A "no-slip" grip, indeed. 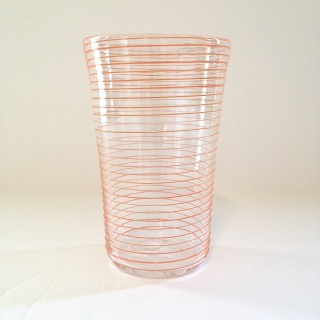 Measuring 3 3/4" w x 5 3/4" h. Dishwasher safe. Will bring a lifetime of libation. A solid and trustworthy drinking glass. 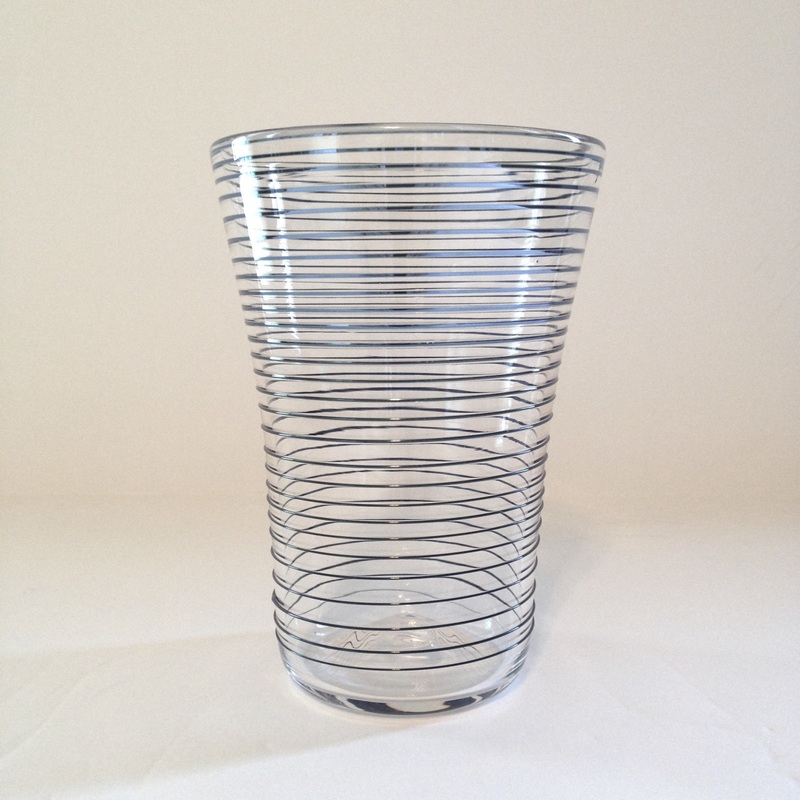 We make our cup out of clear soda lime glass. 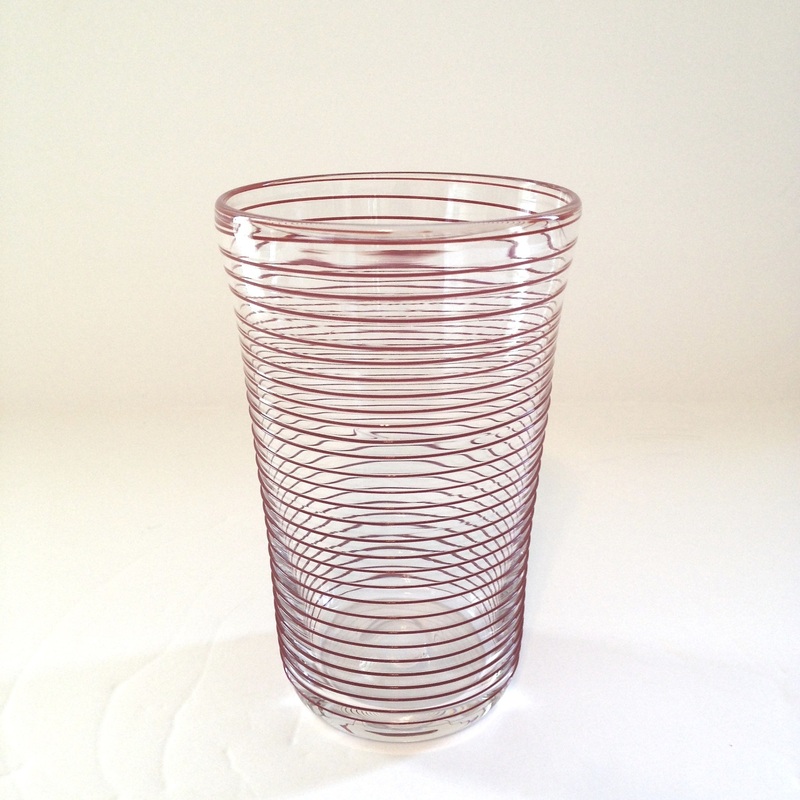 Moments before the punty transfer, we thread a single bead of Opaque Red Glass onto the outside of the Tumbler. The threading is melted in more towards the lip (no texture to interfere with drinking). Towards the base, the higher relief decoration adds to the function. One can hold onto it better! A "no-slip" grip, indeed. 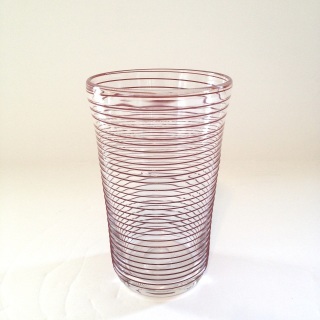 Measuring 3 3/4" w x 5 3/4" h. Dishwasher safe. Will bring a lifetime of libation. A solid and trustworthy drinking glass. 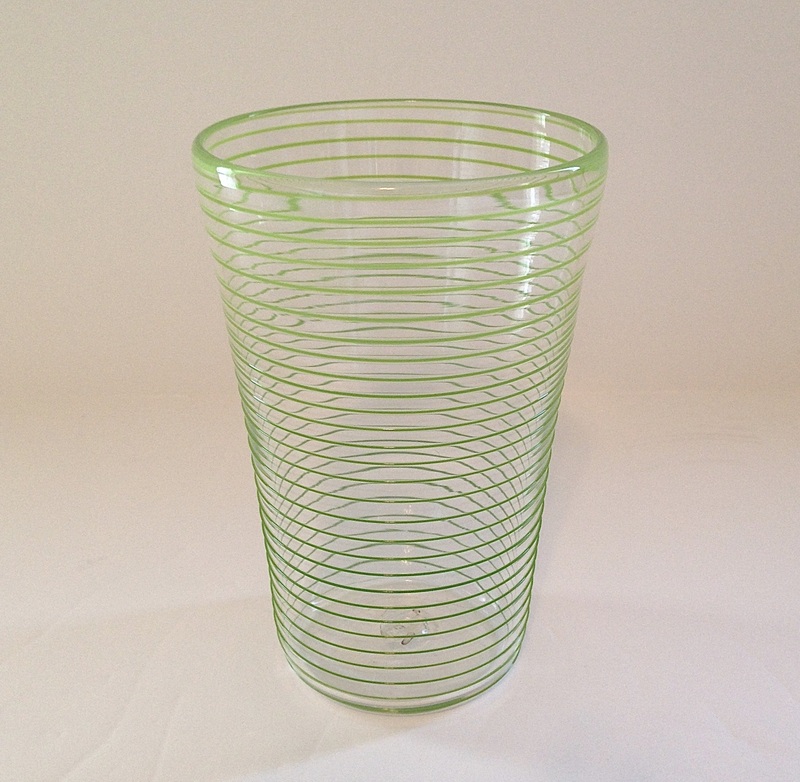 We make our cup out of clear soda lime glass. Moments before the punty transfer, we thread a single bead of Opaque Black Glass onto the outside of the Tumbler. The threading is melted in more towards the lip (no texture to interfere with drinking). Towards the base, the higher relief decoration adds to the function. One can hold onto it better! A "no-slip" grip, indeed. 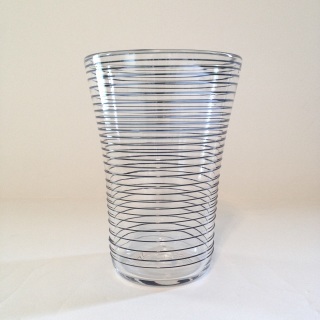 Measuring 3 3/4" w x 5 3/4" h. Dishwasher safe. Will bring a lifetime of libation.